S2F Endurance Coaching is an affordable personalized marathon and triathlon coaching service for both beginner athletes wanting to do their first race and more advanced athletes wanting to improve their performance. IRONMAN Certified Coach Chuck Olson uses on-line tools and in person coaching for those living within San Diego County and southern Orange County. S2F can also provide these same services virtually on-line to marathon and triathlon athletes living anywhere in the world. 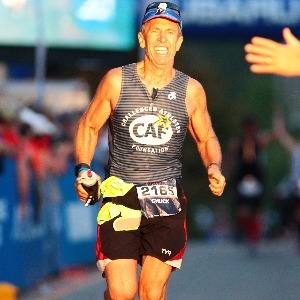 Chuck is a IRONMAN Certified Coach who has completed nearly 50 triathlon races over the last 25 consecutive years, including 5 IRONMAN distance races and 20 IRONMAN 70.3 races. Chuck is a finisher of the Hawaii IRONMAN World Championship. In addition, he has completed over 30 marathon and ultra-marathons during the last 35 years and has recently qualified for the 2017 Boston Marathon. In over 100 events, Chuck has never DNFed (Did not finish) a race. "As a marathon and triathlon coach, I focus on providing positive reinforcement to my athletes, carefully listening to what and how they say things, incorporating two way communication, providing frequent and meaningful feedback, making myself highly available, and providing flexibility in training based on their changing needs and time constraints. I am always happy to explain the reasoning behind my approach. In the end, it's about the athlete's journey, not the coach's. I learned from my experience coaching our wounded service men and women with physical and psychological setbacks, that when there is desire and commitment, almost anything is possible regardless of our natural abilities or physical or psychological limitations. The human body and mind are far more capable of exceeding what you believe is possible." Success. Coach Chuck Olson has been notified of your message.